There are few cities in America that have a LGBTQ community that is as progressive and active as the one in Portland, Oregon. Lesbians and gays in this city tend to live, work, and play all around Stump City, but come June, LGBTQ folks from the surrounding areas, and across the country, descend upon downtown Portland to celebrate the Portland Pride Waterfont Festival together. 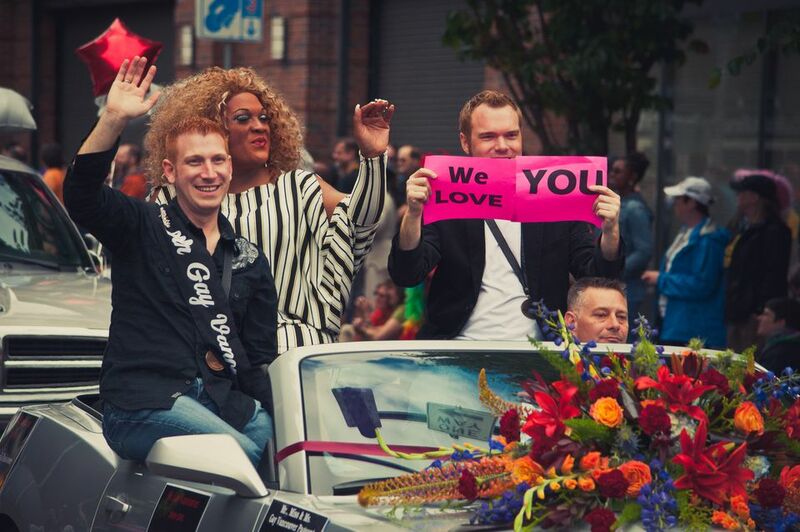 Sometimes referred to as Pride Northwest, this annual celebration is a first-rate event, and one of the largest donation-based Pride celebrations in the country. This event occurs in beautiful Tom McCall Waterfront Park, that overlooks Portland's Willamette River. The festival will take place on June 15-16, 2019, just one week after the Astoria Oregon Gay Pride event. There are two main events that make up Portland Pride and quite a few events and parties, including the traditional Stark Street Pride Block Party at Scandals Gay Bar, and a special Flare Pride Kickoff Party, that is sponsored by the city's premier lifestyle and arts magazine, Portland Monthly. There's also plenty of entertainment options offered throughout the festival, particularly on Saturday night. The headliners are a mix of the top performers within the LGBTQ community; in the past, they have included Prince Poppycock of America's Got Talent, comedian Deven Green, American Idol's Frenchie Davis, and Mimi Imfurst of RuPaul's Drag Race. There is also a large amount of food, crafts, and artisanal goods makers selling their wares. Fan favorites include the hyper-local winemakers Hip Chicks Do Wine, who produce a special Portland Pride label that's affixed to three of their most popular wines, as well as the outstanding Bend and Portland-based Deschutes Brewery. Saturday's events also include the Portland Trans Pride Rally and March, the Portland Dyke March, the women's and trans Portland Pride Inferno Dance, and the Portland Pride Gaylabration at the Crystal Ballroom. On Sunday, the parade begins at 11 a.m. at Burnside and Park Avenues, and runs east along the edge of the Pearl District before turning north up Broadway. The colorful and lively parade then heads further east along Davis Street through Old Town/Chinatown, and then turns south down along Naito Parkway. The parade eventually leads back into Tom McCall Waterfont Park for the finale, and the weekend then comes to a close. However, the fun doesn't stop when the park events are over, as many of the attendees flock to Portland's gay bars to continue the celebration by eating, drinking, dancing, and being merry all weekend long. Portland's fast-growing LGBTQ Latino community hosts a fun and inclusive Portland Latino Gay Pride (also known as PDX Latinx Pride) in late August. The events include a spoken word reading, as well as a series of film screenings, and the Tus Colores Festival that features live performances, food, ballet folklorico, and more. There is also a "SuperQueeroes" drag show and dance party held at the festival's main anchor, District East. Just across the Columbia River from Portland is the city of Vancouver, Washington, which holds an annual Pride event called Saturday in the Park Pride on July 13, 2019. Saturday in the Park Pride (SITPPride) has been held every year since 1994, making it one of the area's oldest LGBTQ-centric events. This free celebration is presented by the LGBTQ Pride of Southwest Washington and takes place in beautiful Esther Short Park, right in the heart of the city's up-and-coming downtown. The event includes live entertainment, local vendors selling their creations, and organizations promoting their important messages and goals, as well as a few more fun activities. It's important to note that these festivals do not compete with one another. Instead, their goal is to bring together the entire LGBTQ community that resides in the Pacific Northwest, whether in Oregon, Washington, or northern California.